CARSON, Calif. (AP) — Although Jon Gruden is still settling back into coaching, he watched more than enough football from the broadcast booth over the past decade to know that the only logical thing to do with the ball on the goal line is to give it to Marshawn Lynch. And no matter what happens, definitely don’t call a pass instead. Just ask Pete Carroll — or, better yet, don’t. 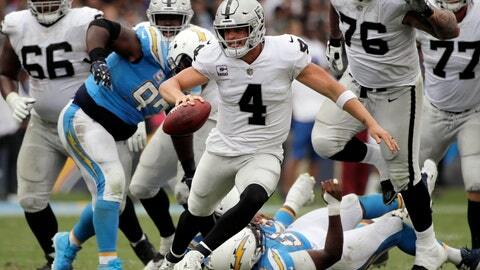 But the Oakland Raiders‘ new boss deliberately didn’t activate Beast Mode with first down on the Chargers‘ 1 late in the third quarter Sunday while the Raiders (1-4) were desperately trying to cut into a 20-3 deficit. Gruden called a play-action pass for Derek Carr, who promptly threw an end-zone interception to Los Angeles star Melvin Ingram. The Chargers also stole the Raiders’ momentum, made a 96-yard touchdown drive and cruised to a 26-10 victory over their longtime AFC West rivals, who still haven’t figured out how to maximize their opportunities during Gruden’s first year back. Gruden’s brazen defiance of conventional Lynch wisdom dearly cost him and his team — and he can count his workhorse running back among those second-guessers he mentioned. Lynch was visibly upset on the sideline, tossing his helmet in the air and yelling loudly to himself while undoubtedly reliving memories of his Seattle Seahawks’ final play in the February 2015 Super Bowl. Gruden took the blame for the call, but also gently chided his quarterback for not executing at the pivotal moment. Carr, who went 24 of 33 for 268 yards and one late touchdown, readily agreed with his new boss’ assessment of his predilection for pressing. Carr also gave the Chargers credit on the interception, noting that his first two options were covered. The Raiders’ offensive failures weren’t limited to that one play-call on the Chargers’ goal line. Los Angeles outgained Oakland 412 yards to 289, and the Raiders’ offense managed only 14 first downs and a mere 41 yards rushing. After Amari Cooper had eight catches for 128 yards and a touchdown last week against Cleveland, the receiver had one catch for 10 yards on his only target against Los Angeles. Carr defended his inability to get the ball to Cooper, saying the Chargers were keyed on stopping the playmaking pass-catcher. Although Gruden and Carr have only one win together, they still appear to be connecting on the plan to build a long-term foundation for the Raiders.